As much I hate to recommend disabling such a powerful and useful component I have killed the version of Adobe Flash currently on my system. There are too many reports of infected sites to take any chances. Versions that appear to be affected include 9.0.115.0. and 9.0.124.0. One of the new features of WinPatrol is the ability to disable ActiveX components that exhibit vulnerabilities. This feature is so important it’s included in the free and USB Flash version. 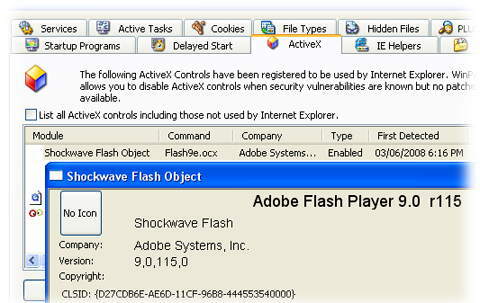 If you have WinPatrol you can select Flash9(x).exe and click on Disable. You can always Enable again if you really need to but hopefully a new version of Flash will be released soon. Note: This is a drastic step. You will not be able to view most YouTube videos and will see a number of broken image boxes. The good news, you'll also miss some advertising as well. the latest Flash Player update, 9.0.124.0. " Thanks for the info Bill. I use an extension block flash in my browser Firefox but I many times find that friends send me links to Youtube to see things. Will think twice about it now. I'm not suggesting that viewing flash videos on YouTube is necessarily a problem. I like to think that any YouTube videos with malware would be taken down quickly but that's another issue. What I wanted to point out is if you disabled Adobe Flash using WinPatrol or other programs it will disable most YouTube videos. Most people don't realize that YouTube converts videos to both Flash and Quicktime depending on the platform. So I still recommend disabling Adobe Flash for now, but though you needed to know it will affect many popular features on the internet like YouTube. 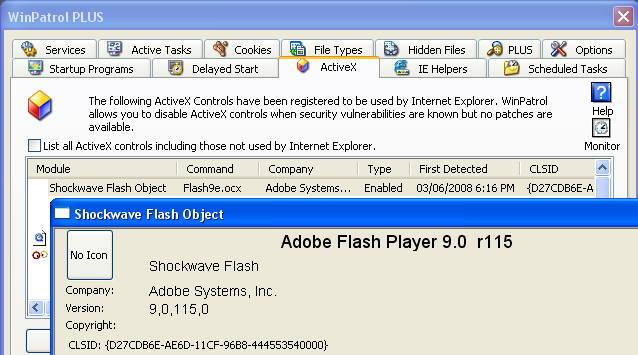 According to Adobe, the vulnerability in question is a known one and is fixed in version 9.0.124.0. So, if you have a previous version installed, now is the time to upgrade to version 9.0.124.0.